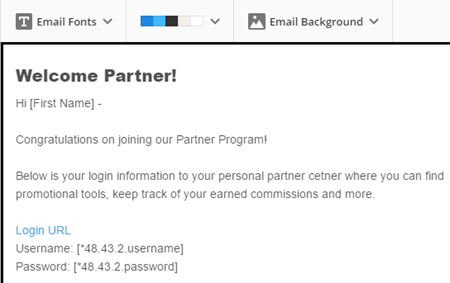 A Partner welcome process delivers a welcome email along with the new partner's username and password so they can access their Partner Center on your integrated WordPress site. Navigate to Campaigns. Create a new Campaign or open an existing one related to your Partner sign-up form. Locate the Trigger or Goal that you created to Add new Partners to your Campaign. Below the Update Contact element, add an email action element after the Trigger or Goal. Insert the merge fields for Username and Password for your integrated Wordpress site. Optional: Include some promo tools, available in your merge field dropdown under the heading Affiliate Links. Click Settings and enter subject line, send from, reply to details and Copy from HTML. A Partner thank you process sends a thank you email each time they make a sale. It's a way of thanking and encouraging partners to keep up the good work and effort. Note that this process sends an email for every sale so if you have a payment plan or recurring subscription, they will receive an email with each successful subsequent payment. Create a partner thank you email. Navigate to Campaigns > Messages > New Message. Edit the ONTRAmail content thanking your Partner for the referral business. Turn on the Email notifications in your Partner Program. 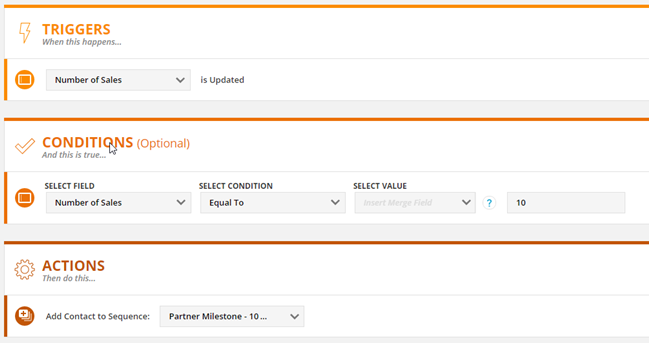 Navigate to Partners and Select your Partner Program. Locate the "Notify partner when they have earned a commission with an email" section and select "Send Email Notification"
Select the Email Message created above. Navigate to Campaigns > Messages > New Message. Edit the ONTRAmail content congratulating your Partner on reaching a milestone. You may wish to use the [Total Sales] or [Number of Sales] merge fields to indicate their exact achievement. Repeat to create an email for each milestone you want to recognize. Navigate to Campaigns and create a new Campaign or edit an existing one. Add a Goal (or a Trigger). A Goal is recommended as it's a milestone your Partners achieve. Select Field is updated from the dropdown menu. Select the field Total Sales. You may also use Number of Sales but note that this will increase with each payment on subscription plans. Adjust the Settings and click Done in the Settings panel. Add a Condition and select Field is updated. Select the field Total Sales. Select the condition Equal To. Enter the value of the total sales (e.g. $5000) for the Partner milestone. 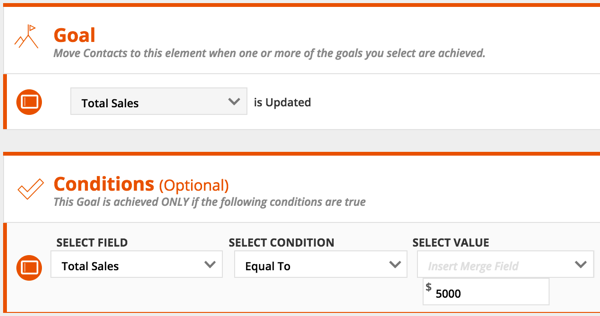 Add a Send an email action element below the Goal and select the email you created for the milestone. Repeat these steps for each milestone. This version uses a Step Sequence which is a Legacy feature of ONTRAPORT. We highly recommend that you use a Campaign to create all processes. If you wish to use this feature, follow the steps below. A Partner welcome Step Sequence serves to deliver new partners their username and password to access their Partner Center on your integrated WordPress site. Below is the recommended way to set this up using a Sequence. If you are unfamiliar with how Sequences work, check out the forum post on Sequences. If you have an ONTRAPORT Pro account or higher, navigate to Administration > Legacy Features > Sequences and toggle it to on. Sequences will appear under your Contacts collection. Add a Rule step. Under "Then do this:" select "Change the value of a field". Use the drop down to select the "Partner Program" field. Then, use the next drop down to select your Partner Program. Add another Rule step. Under "Then do this:" Select "Give access to Wordpress Membership Level". Select the website you would like to give access to. 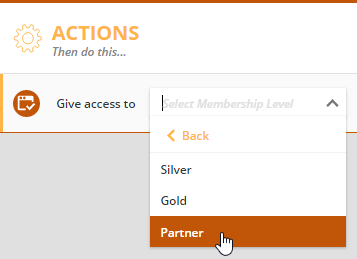 Select "Partner" as the membership level. Insert the merge fields for User Name and Password for your integrated WordPress site (if you have multiple integrated WordPress sites, be sure to select the merge fields under the correct WordPress site). A Partner thank you process sends a thank you email to your Partners each time they make a sale.It's a way of thanking and encouraging partners to keep up the good work and effort. 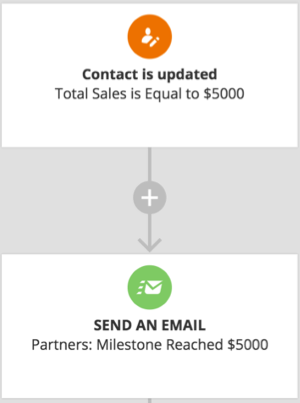 Note that this process sends an email for every sale so if you have a payment plan or recurring subscription, they will receive an email with each successful subsequent payment.You can go even further and set up Sequences for Partner sale milestones which is discussed at the bottom of this post. Select the Email Message created in step 1 above. Select the trigger A Certain field is updated. Select the field Number of Sales. Select the action Add Contact to Sequence. Select the sequence you created in step 2. Also, in this documentation, isn't the "Create a partner milestone email" (step 1) redundant, since you informed us to then create another one (step 2d) within the sequence?